Metso's Neles double acting and spring return B1-Series piston type actuators are designed for use in both modulating control and on-off service. The series B1C and B1J are designed to ISO 5211/1 when Metso linkages are utilized. These actuators offer an extremely long cycle life and are well suited to operate almost any type of rotary valve. When "stay put" is the requirement, the double acting B1C series is the choice. This series is available in several sizes with torque outputs from 40 Nm to 100 000 Nm (29.5 lbf ft to 73 756 lbf ft) for maximum supply pressure of 10 bar (145 psi). If a failure mode is required, the spring return B1J series should be selected. This line offers a self-contained spring cartridge to provide failure in either the open or closed position. The spring return actuators are available with a mid-range spring for a 4 bar (58 psi) supply range, a lighter spring for lower supply pressure of 3 bar (44 psi) range and a stronger spring for a 5.5 bar (80 psi) range. These actuators offer torque outputs from 25 Nm to 12000 Nm (18,5 lbf ft to 8851 lbf ft) for maximum supply pressure of 8.5 bar (124 psi). As with any Neles pneumatic/hydraulic actuator, adjustable travel stops are standard for both the open and closed positions. End of stroke turning angle range is 85° to 95°. Optional travel stops 0° to 90° are also available. High quality bearings provide support on the upper and lower portions of the lever arm to reduce friction and expand the life of both the lever arm and the housing. The epoxy painted actuators have housings of rugged cast iron, with light-weight aluminum cylinders anodized for added corrosion resistance. Travel stops are stainless steel. The springs in the B1J actuator are contained in a cartridge for added reliability and easy maintenance. The standard spring return actuator on the ball valve can provide spring-to-close or spring-to-open operation sim- ply by changing the mounting position by 90°. On a high performance butterfly valve, the standard unit offers spring-to-close operation. An optional B1JA model is available for spring-to-open requirements. The standard unit can be used in temperatures up to 70 °C (158 °F). High temperature construction is available for temperatures up to 120 °C (248 °F). The standard unit can be used down to -20 °C (-4 °F). A low temperature design is available for -40° to +70 °C (-40° to 158 °F ), arctic service please refer type coding. For applications where very fast and high frequency operation is required. 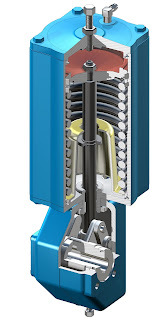 The oversized cylinders (B1C 60, 75, 602, 752) are used whenever the supply pressure is limited, thus the actuators can achieve the required torques with a lower supply pressure level. Available override devices include a manual centerpiece handle, a manual handwheel override, and a manual hydraulic override for high torque applications. Emergency Shut-Down (ESD) valves utilizing B1J actuators are offered to assure operation in the event of a fire or plant malfunction. For more information about Metso Neles actuators, visit http://www.meadobrien.com or call (800) 892-2769.